While everybody can get tired sometimes, dealing with extreme or excessive fatigue can be a very difficult thing. For those who experience this type of fatigue, daily tasks can seem insurmountable without the energy to accomplish them. 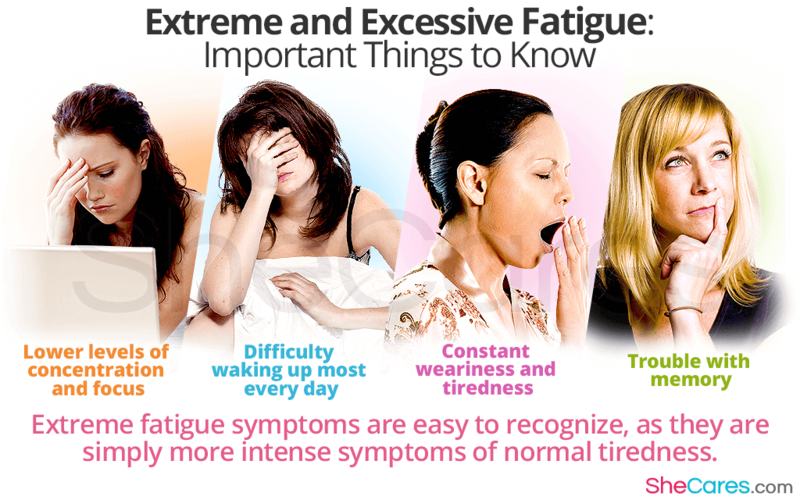 Read on to learn more about the symptoms of excessive fatigue and what may cause this problem. The hardest part of recognizing extreme fatigue is differentiating between normal tiredness and a tiredness that is more problematic. Losing a night of sleep can cause extreme fatigue, but can be easily fixed by catching up on sleep. Unlike this easy fix, in many cases, the causes of extreme fatigue make the problem more difficult to mend. One common cause of extreme fatigue in women is an imbalance in estrogen levels, which is especially common during menopause. Because the hormone estrogen is so important in so many different actions in the body, a drop in estrogen - which can happen for a number of reasons, including the menopause transition - can impact certain body systems. The sleep cycle is one such system that requires estrogen to help regulate it. Without enough estrogen, sleep can be disrupted, and energy levels can drop even without a significant lack of sleep. Adrenal fatigue is another popularly-cited hormonal cause of excessive fatigue. However, this is not an accepted medical diagnosis, and care should be taken to remain skeptical of placing too much faith in a diagnosis of adrenal fatigue. According to practitioners who support the existence of this condition, long-term stress subjects the body to a long-term need for hormones released by the adrenal glands, which induces the “fight-or-flight” mechanism in the body. However, the adrenal glands eventually cannot keep up with the body's stress and cannot produce enough hormones, causing exhaustion and other symptoms. A number of other conditions may also be behind the causes of severe fatigue. Heart disease. Of the non-hormonal causes, heart disease is among the most common causes of fatigue. If the heart cannot oxygenate enough blood and pump it to the rest of the body efficiently, it causes fatigue and exhaustion. Organ failure. Especially liver or kidney failure, this is another possible explanation. This generally occurs because the body spends energy trying to maximize efficiency of an organ that is no longer working as it should. Depression. This is another likely reason for severe fatigue. Depressive illnesses affect neurotransmitters, which are essential for the proper function of the brain. If they cannot work correctly, the brain is likely to become fatigued and cause the rest of the body to become tired as well. Other conditions. Chronic fatigue syndrome and fibromyalgia are two diseases that produce mainly the symptoms of chronic exhaustion, which could be the reason for excessive fatigue. A number of other illnesses can also cause fatigue, many of them because the body is attempting to fight off the infection. Some lifestyle changes can also help to manage excessive fatigue without need for supplements or medications. If your fatigue persists for two or more weeks even though you have been resting and reducing stress, call a doctor for an appointment. To learn more about how to manage fatigue, read about the best diet for chronic fatigue.